Appearances have proven true, with ESPN filing suit against Verizon in New York Supreme Court yesterday. Details of the suit are scarce, as ESPN hasn’t yet filed a complaint, but the summons (shown below via Ars Technica) indicates they will be seeking injunctive relief and damages based on their breach of contract claims. Without seeing the agreement between ESPN and Verizon or ESPN’s soon-to-be-filed complaint, we can only speculate as to what ESPN’s breach of contract argument will be. What is clear is that ESPN (as well as 21st Century Fox and NBCUniversal) sees Verizon’s new FiOS cable packages that move their programming to optional tiers as a threat to their current business model, which is based on their programming appearing on all basic cable packages, bringing in hefty subscriber fees. ESPN’s position in their suit might be that their agreement with Verizon stipulated that their channels would appear on all basic cable packages, thus FiOS’s optional packages are a breach of contract, while Verizon’s defense could be that Verizon FiOS is a distinct offering featuring new fiber optic technology that isn’t bound by the original agreement. ESPN has over 100 million cable subscribers via the major cable companies who each pay ESPN about $6.10 per subscriber. According to Michael Nathanson of MoffetNathanson Research, if ESPN went fully a la carte, their users would have to pay $36.30 per month. If cable operators are able to shift ESPN to option tiers, their subscriber base would surely fall, hurting their bargaining position when their current agreements expire. In addition, ESPN doesn’t have an opportunity to negotiate higher subscriber fees for these optional tiers, which must have been part of the year long negotiation between ESPN and Dish Network regarding their new streaming service SlingTV. I would be surprised if this suit went to judgment, as ESPN has already set a precedent with Dish Network for new streaming cable service agreements. It may take a year or so for the lawyers involved in this matter to be satisfied with their billings, but I suspect we’ll see a new agreement between ESPN and Verizon that will account for FiOS and allow ESPN to inflate the sports cable bubble for years to come. Everyone involved with cable television knows that a la carte programming is coming, but it appears ESPN, the network most responsible for inflating sports cable bubble, isn’t going down without a fight. Verizon FiOS, a new fiber optic television and internet offering from Verizon, made their cable packages available to the customers yesterday, which included pared down options that makes ESPN’s channels an option, rather than a necessary part of the pay television experience. The reason why Disney is protesting Verizon’s new offering is because ESPN makes $6.5 billion, roughly two-thirds of their revenue, from cable and satellite affiliate fees. If ESPN begins to be relegated to optional tiers by cable companies, those fees would undoubtedly decrease the next time they meet at the negotiating table. This is a position ESPN can ill afford to end up in as they have billions of dollars in rights fees guaranteed to most of the major US pro sports leagues for years to come. With cord-cutting slowly gaining steam and many Millennials not even buying into cable television at all, cable operators are grudgingly realizing that changing their business model is the only way to retain the next generation of television viewers, hence Dish Networks’s Sling TV and now Verizon FiOS. However, the deflation of the sports bubble will probably take years to begin deflating, as ESPN has over 100 million subscribers via cable providers and cord-cutting isn’t increasing at the rates initially projected. Most likely, it will come, as Hemingway wrote in The Sun Also Rises, “Two ways, gradually and then suddenly.” Consider these new cable offerings the first shot across the bow. It’s Baseball Week at TechGraphs. Our writers are sharing the tools they use to follow along in the season. Michael Tunney’s thoughts are below. For the average baseball fan, an MLB.TV subscription that costs over $100 per season probably seems like an overpriced luxury. But for baseball fanatics, procuring an MLB.TV subscription is a fait accompli, an annual rite of passage. My reasons for not doing so are twofold: 1. the price point and 2. an intense fear that all of my worldly obligations will be thrown to the wind upon receipt of said subscription. Instead, I have collected a number of means by which I am able to keep up with all the games without throwing my life away in the pursuit of watching all of the baseball things. First, I use the MLB At Bat app to keep up with individual games, watch highlights, and subject myself to terrible White Sox broadcasts with Ed Farmer and Darrin Jackson because I hate myself. I’ve made it clear, repeatedly, on TechGraphs that I’m a fan of Bob Bowman’s efforts with MLB Advanced Media, and find this app gives me 80 percent of what I need to follow any particular game. For $20 you get a whole season’s worth of radio broadcasts for all 30 teams, Pitch f/x, in-game video highlights, and MLB.TV’s Game of the Day. Instead of listening to tunes or podcasts during the season I usually listen to radio broadcasts of whatever game interests me at the moment, whether it’s a good matchup or one of my fantasy pitchers are on the bump. Second, Twitter. Not just any kind of Twitter, “baseball Twitter.” I use it to follow all the latest news and deals, and keep up with injury updates and roster moves. I went through all of my follows and made a baseball Twitter list you can follow here. If you have any suggestion please add them in comments! One of my favorites for keeping up with the annual fantasy closer carousel is @closernews. I don’t know who maintains this feed or why, but I am eternally grateful and it’s one of the reasons I always finish near the top of my fantasy league in saves. I only participate in one longstanding fantasy league because life, so I’m always checking in on Yahoo’s Fantasy Sports site, as well as their Yahoo! Fantasy Sports app, which can be maddening at times (I missed a Drew Hutchison quality start on Opening Day because it didn’t show he was starting when I checked, but also because I’m an idiot). I also check Rotographs and Razzball on a regular basis, as well as Buster Olney and Keith Law’s blogs via ESPN Insider. Buster gives a daily rundown of everything that happened in baseball the day before, which I scroll through every morning to check for news on my fantasy team and to stay in the loop in general. All this baseball buffoonery was put to the test this week as I was on the road, pretending to work in a Santa Monica cafe on Opening Day, and I was able to keep up with everything I needed by toggling between the MLB At Bat app, Twitter, and FanGraphs’ live chat throughout the day. If any readers have suggestions for ways to follow baseball without MLB.TV (or an actual TV) please add them in the comments, along with the best baseball Twitter follows! Some media companies seemingly redesign their site every year to keep up with the latest technology and best practices in the web content world. But ESPN is an anomaly in this regard, with ESPN’s product SVP Ryan Spoon telling VentureBeat, “Nothing says we need to redesign the site.” ESPN.com is one the highest trafficked websites in the history of the Internet, getting 2.3 million visitors per hour, yet somehow hasn’t redesigned their website for six years! The roll out of their redesign actually started months ago with the redesign of their mobile app, switching from the curiously named “SportsCenter” to simply “ESPN”. The basic navigation for the website, mobile app and iPad app is about the same now that they are responsively designed. All three versions come with your favorite teams’ news on the left column (which you can set when you sign in), a news stream in the center, and an “ESPN Now” column on the right, which is a curated Twitter-like feed showing a mix of news, videos, and and Tweets from ESPN personalities that can be easily shared on social media. So instead of having a two different versions of the site, one for mobile and one for the web, every version scales to the size of each device providing a pretty uniform experience. Sixty-one percent of ESPN’s 94 million users in the US view ESPN exclusively on mobile devices, with a good percentage of those users viewing the mobile web version. From Spoon’s piece about the redesign on Medium, it seems ESPN is hoping the new responsive design will be pull those mobile web users to their newly redesigned ESPN app. 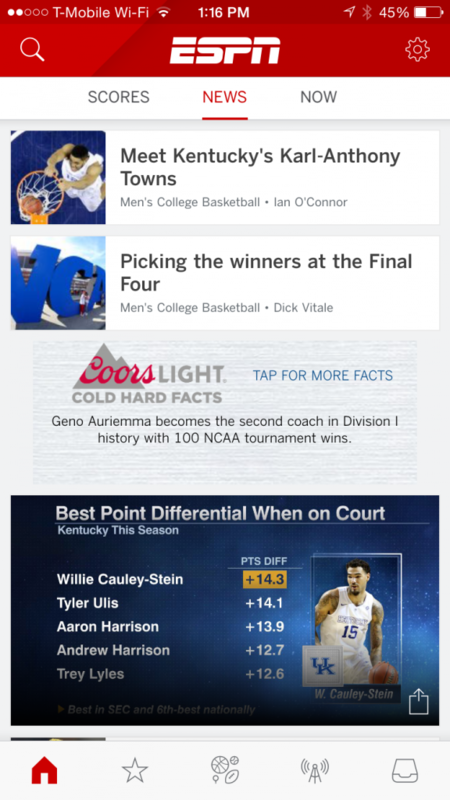 ESPN seems to be doubling down on mobile content cards, which appear in the ” ESPN Now” column and can be distributed to Twitter, Facebook, and other social media sites with one click. This is the latest evolution in mobile content, with creators having less qualms about keeping people on their actual website and instead getting views on whatever platforms are getting eyeballs. 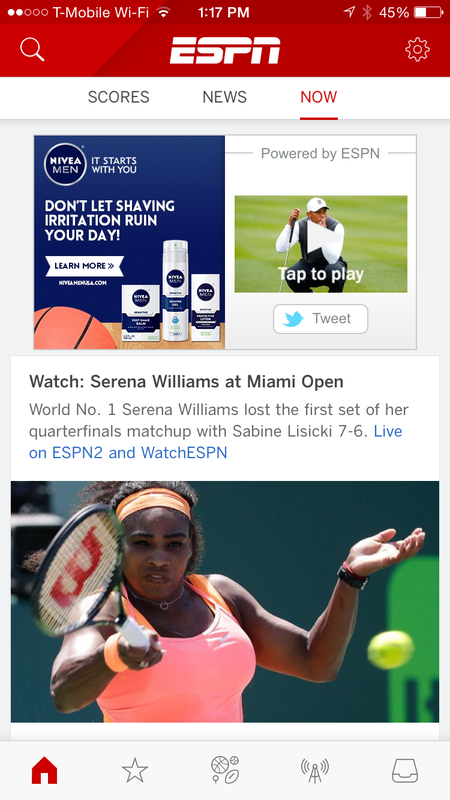 For example, we covered the launch of Snapchat Discover, which ESPN exclusively partnered with to provide content. The partnership has gone better than either side could have imagined, and while neither party would disclose numbers, a recent Winter X Games post logged close to 30 million views. Another new feature with ESPN’s redesign is infinite scroll, with unlimited stories popping up as you scroll down the page — another signal of the shift from the pageview economy mindset. It is yet to be seen if the new redesign will drive users to ESPN’s new mobile app, but any redesign is welcome at this point, even if it merely draws a “meh” from sports fans. ESPN.com is finally in the 21st century with a responsively designed site, hopefully they won’t wait another six years to update this one. MLB Advanced Media, or the biggest media company you’ve never heard of, is about to embark on a video streaming expedition the likes of which the internet has never seen, supporting five launches in the next month alone, all while providing video streaming infrastructure for CBS Sports, ESPN, and WWE. As was previously reported by TechGraphs, HBO Now is being launched with an exclusive partnership with Apple TV, which created whispers that Apple is looking to start their own over the top streaming service like Sling. Whether you’re a fan of the big fight knockouts Tyson served on Michael Spinks and Larry Holmes, or his early career beat downs on the lower rungs of professional boxing as an 18-year-old phenom, they are all there in over 57 minutes of punishing fury. This clip adds more credence to Jamie Foxx’s announcement on the Breakfast Club Power 105.1 radio show last week that he will be starring in a biopic about Tyson, directed by Martin Scorcese and written by Terence Winter, who created Boardwalk Empire and wrote the screenplay for Wolf of Wall Street. Scorcese’s last boxing film was Raging Bull, for which Robert DeNiro won the Best Actor Oscar in 1980. If Tyson is sincere about using the web to crowdsource his best knockouts, YouTube sure is an interesting community to select, as their commenters generally leave a lot to be desired. However, the video has already eclipsed over one million views in just a few days, which adds support to the viability of the project. A film montage of Tyson knockouts would be one of the best ever, yet entirely unlikely to eclipse the best of all time — Push It To The Limit from Scarface. FanAngel is a site that, in a just world, wouldn’t exist. The crowdfunding site enables fans to become patrons of NCAA athletes, donating money to persuade said athletes to stay in school, with the site holding the money in escrow until the athlete’s eligibility expires. While it is true that NCAA athletes from power conferences have been getting the shaft for decades by not being compensated properly for their increasingly valuable labor, crowdfunded donations from fans do nothing to alleviate the exploitative labor conditions under which NCAA athletes operate. In the event that a FanAngel crowdfunding campaign is successful and the athlete’s NCAA eligibility expires, 80 percent of the money would go to the athlete, 10 percent would go to the athlete’s teammates (nice touch! ), and 10 percent would go to a scholarship fund or charity. FanAngel makes money by taking 9 percent of the total amount raised (more on this later). Of course, if the athlete doesn’t stay in school the money is refunded. Shawn Fotjik, founder of FanAngel, said in an interview with ESPN sports business reporter Darren Rovell, “If you wanted Marcus Mariota to stay in school for his senior year, you could give $20.” I applaud Fotjik on getting good PR from Darren Rovell, but Marcus Mariota is either going #1 or #2 overall in the 2015 NFL Draft and there is no amount of money FanAngel could raise that could keep him in school. Contributing to a crowdfunding campaign for teenagers who are exceptionally good at big time NCAA sports, and also strangers to the donor, is something I’d assume would be creepy to most well-mannered adults. As has been proven time and time again in my life, I am wrong about this assumption. Fans of Jarrell Martin, a sophomore forward for the LSU Tigers who, according to DraftExpress.com, is projected to be drafted at the end of the 1st round in the upcoming NBA Draft, have raised over $700 on FanAngels for him to return to LSU for his junior and senior senior seasons, completing his NCAA eligibility. Understanding that FanAngel is a new venture and will need time to scale both users and donations, it still strains credulity to see this ever happening. For a glimpse of what might be in Fotjik’s future, FanPay, a crowdfunding site which raises donations as graduation gifts for college athletes, has received over 100 cease-and-desist letters from universities and conferences. Additionally, FanAngel may want to rethink the 9 percent fee they collect for successful campaigns. Other supposedly altruistic crowdfunding donation sites have been taken to task in the past for collecting high fees. One of the worst offenders is Give Forward, which collects 7.9 percent of every donation plus a $0.50 transaction fee. Nine percent is a laughable amount that puts FanAngels in the same exploitative waters they claim they are trying to drain. If college sports fans suffering from hero worship want to contribute to an NCAA athlete’s cause, they should skip crowdfunding platforms and donate to the National College Players Association (NCPA), which spearheaded the player union movement at Northwestern. Or do what has been done for time immemorial, put some cash in an envelope and make a handoff. ESPN released their “Great Analytics Rankings” last week, placing the Houston Astros second behind the Philadelphia 76ers as the most analytically-minded pro sports organization. In their profile of the Astros, ESPN speculated that the Astros were the mystery MLB team that purchased a Cray supercomputer last year, but the company responded on their blog this week that the team that bought it won more games than the Astros, declining to what team purchased for confidentiality reasons. Nick Davis, PR manager for Cray, wrote on their blog, “While I’m not going tell you here who the team is, I can tell you that it’s not the Astros. We think it’s great the Astros are ‘all-in’ on analytics according to ESPN, but unfortunately they are not all in with Cray. At least, not yet. I will say this — we applaud the Astros for their adoption of analytics, but the team with a Cray won more games last year. According to The Economist, 95 percent of all MLB data has been created in the last five years. With MLB’s award winning Statcast system projected to be installed at all 30 MLB parks, this kind of computing power may become necessity for analytics departments to process mountains of data quickly. For any sleuths out there trying to find the mystery team, Pete Ungaro, Cray’s CEO, said that the team who purchased the supercomputer is an organisation that five years ago people would not have guessed would want one. The biggest media company you’ve never heard of won an Alpha Award for Best Analytics Innovation/Technology at the MIT Sloan Sports Analytics Conference last week for their player tracking system called Statcast. Statcast was introduced publicly by MLB Advanced Media (MLBAM) during the 2014 season in a limited number of ballparks. At the Sloan Conference, Commissioner Rob Manfred announced that all 30 ballparks will have the Statcast system installed by Opening Day this year. Statcast uses cameras installed in multiple areas around the park to track player movement throughout the game. As you can see from the videos below, the data Statcast can analyze is staggering, spitting out everything from batted ball and player speed to reaction times and pitcher extension. Dave Cameron, our esteemed head honcho at FanGraphs, was part of a panel at Sloan this year and also reported on the most interesting parts of the panel Manfred was a part of with MLB Network’s Brian Kenny. In a wide-ranging interview with Kenny, Manfred said that Statcast would provide real time data through the premium version of the MLB At Bat App as well as some data on MLB.com. More importantly, Manfred intimated that the model for Statcast data would eventually resemble the PITCHF/x model, with the data being publicly available instead of hoarded by teams. With estimated revenues of $800 million on 2014, streaming video deals with WWE and Turner Sports, and Statcast technology available in all 30 ballparks in 2015, MLBAM will soon be a media giant that everyone has heard of. The NHL is slowly creating a new beat for sports journalists, announcing yet another technology partnership, this time with cloud software provider SAP, who will help the NHL.con introduce advanced statistics and redesign how they are presented. Coming the heels of releasing 35 new advance statistics to NHL.com and partnerships with Go Pro and Sportsvision, the NHL is quickly storming to the forefront of sports technology. SAP was already the NHL’s official cloud partner and this new partnership will further cement their relationship. It also helps that the majority owner owner of the San Jose Sharks is SAP co-founder Hasso Plattner. The full extent of these initiatives will be released in phases, the first of which is the redesign of the NHL.com stats page and the introduction of new advanced statistics. For those looking for a proper introduction to the NHL’s new stats package head over to their enhanced stats introduction here.